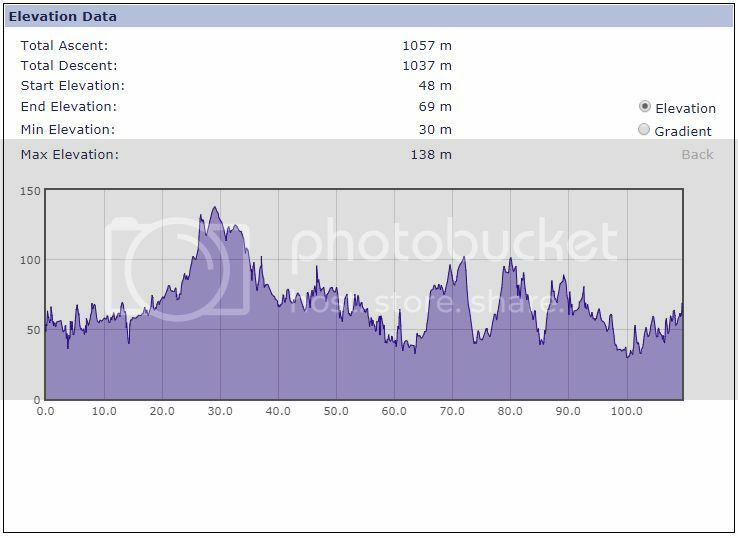 Can someone enlighten me why there's such a large difference and which figure's likely to be nearest the actual climb? What model is your GPS? Depending on whether it uses barometric or GPS altitude, bikehike might take altitude from your unit or it might with it out from comparing your tracklog with its topo basemap. given you can pretty much count 400m in major elevation changes, it is going to be higher than the Google total, you can see a couple of what look like GPS "feature" dips (although they might have been real?) so the answer is likely higher than Google but not quite as high as bikehike, 10% off? What model is your GPS? I've checked and the GPX file contains elevation data. What are GPS "feature" dips? Where the GPS decides you've gone up and down while standing still (or at least, riding on the flat). Possible eg candidates are at c. 5, 15, 63, 106. Of course, they might be real, but GPS units have previous in making these things up. BikeHike is not that sophisticated. It will simply use the elevations it finds in the track, regardless of the GPS model, or if no elevations exist it will offer the option to add them from DEM. I think the dips are those at around 5km and 15km, and likewise the spike at about 46km - they do look like anomalies. Some software will smooth these out when calculating climb, some won't. The GPS itself smooths to a certain extent because each recorded point is actually averaged from several fixes. The question of how to get a 'best' or at least somewhat meaningful climb figure from a tracklog has been explored endlessly in other threads, with no real concensus. Me, if it was important enough I would display the tracklog over a 1:50,000 OS map (in Memory Map for example, or you could do it in BikeHike) and count the contour lines crossed, X10 then divide by 2. But most people expect something a bit more 'just works' than that! It looks like Google Maps has aggressive filtering (or smooth low resolution data) and BikeHike has none and very noisy data. 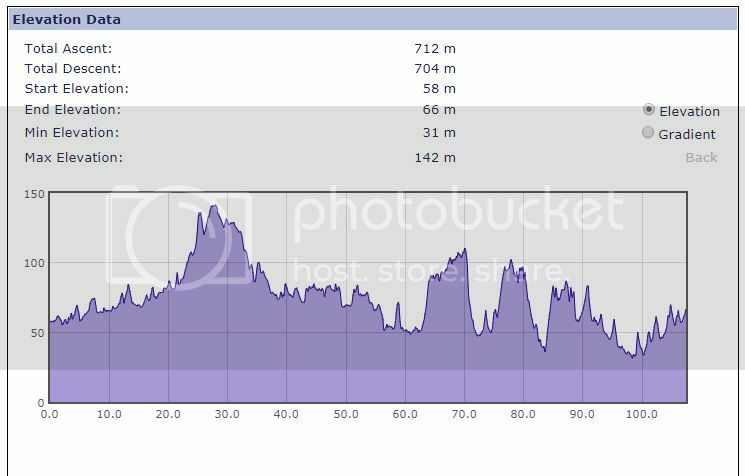 That plateau around 70 km looks interesting - did those big spikes on the BikeHike graph actually exist? ...and the metres climbed now comes out at 712m - which is pretty near halfway between the two previous numbers! Which clearly shows the extra GPS noise ("GPS feature dips") but also appears to remove some climbs/descents completely (e.g. just before 70km) which puzzles me. The question of how to get a 'best' or at least somewhat meaningful climb figure from a tracklog has been explored endlessly in other threads, with no real concensus. I don't usually worry about elevation data in tracklogs: I simply use GPS for route-finding and Proof of Passage. I only asked the question here due to the extreme discrepancy between the Google and GPX figures. I'd not realised that this topic had been explored endlessly. Me, if it was important enough I would display the tracklog over a 1:50,000 OS map (in Memory Map for example, or you could do it in BikeHike) and count the contour lines crossed, X10 then divide by 2. But most people expect something a bit more 'just works' than that! That not far off what Bikehike is doing. Only with finer grained contours. 2) The smoothing algorithms used by the site in question. A poor quality DEM will have elevation inaccuracies and dips/peaks that don't exist in reality. Many sites mask this with some smoothing, but it can easily smooth out real lumps/bumps giving false readings. As with most things, get a range of answers, discard outliers and average the rest. Climbing numbers are a can of worms, where there's basically no such thing as a real answer, even if you discount inaccuracies, fluctuations, and unknown smoothing algorithms, and imagine you've got a hypothetical 100% accurate altimeter. It basically comes down to how high a climb has to be before it counts as a climb. The smaller the climb you count, the larger a climbing number you'll get. Just work out what number you would get if you counted every mm climbed over ever bit of gravel chipping along a whole route, even if it's pan flat along the cide of a canal. Even if it's a flat sealed road, if the surface is coarse chippings that can easily cost up to 2 gears in terms of effort. It is actually like riding up a fairly gentle gradient. Hence my use of "if it was important enough".